These cards are in SP/NM condition. SLIGHTLY PLAYED (SP)- Cards in Slightly Played condition show definite, minor wear. Examples of cards in this grade include cards with mild border wear, minor corner wear, minor binder bending, or scuffing/loss of sheen on the front due to play wear. 3x Ratchet Bomb 1x Buy a Box Promo FOIL & 2x Regular M14 Magic 2014 Core Set MTG. Condition is Used. Shipped with USPS First Class This card is NM/ LP. It comes shipped in a penny sleeve and top loader in a plain white envelope. If ordering multiples or would like a padded envelope with tracking please send me a message. New PROMO through the end of the year. 3x Door of Destinies x1 Foil & X2 Regular M14 Core Set Magic The Gathering MTG. Condition is Used. Shipped with USPS First Class This card is NM/ LP. It comes shipped in a penny sleeve and top loader in a plain white envelope. If ordering multiples or would like a padded envelope with tracking please send me a message. Card is Mint to near mint and has never been played. You are purchasing 1x SPANISH Ring of Three Wishes from Magic 2014 Edition. This card is lightly played. 1 Foil Door of Destinies from M14 in Excellent condition showing light wear. G (Good) - Moderate to heavy wear from play. All edges show whitening and surface probably shows wear. This may also be a card with a single bend or light crease that would otherwise be NM. Pyromancer's Gauntlet. MTG Core Set 2014. Strionic Resonator - Magic 2014 Core Set. Staff of the Mind Magus x 1 (FOIL) from M14!! Moderate Play – These cards will show scratches and have signs of wear along the corners and edges. Light Play – There will be wear along the outside edges. Coloring might be worn but very slight. Mint/Near Mint – These Cards will have little to no visible play or scratches. Rod of Ruin x 4 from M14!! Single cards are enclosed inside a soft poly case and then slid inside a hard case. If cards are thick they are contained within a hard magnetic case. 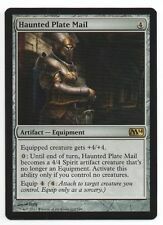 Haunted Plate Mail x 1 from M14!! Darksteel Forge from Magic 2014. NM condition. 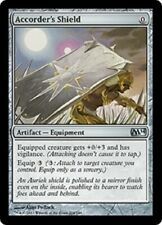 Magic the Gathering: Set of 4x cards of Strionic Resonator. Strionic Resonator // M14 // MTG Magic the Gathering. Feel free to contact us for more information. Will be shipped within two business days of purchase. Set - Magic 2014. Rarity - Uncommon Foil. Foil Curl - Yes. Condition - See scan - if only 1 available the scan is of the exact card. If multiples available I scanned the one with the worst condition in my opinion. STRIONIC RESONATOR - JAPANESE. This is the Magic the Gathering Card Strionic Resonator, from Magic 2014. MAGIC 2014. MAGIC THE GATHERING. NO EXCEPTIONS. (C) WIZARDS OF THE COAST. This card was bought from the original owner and is in Near Mint condition. 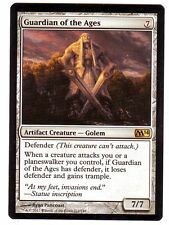 Based on Wizards rule any language MTG cards should be allowed to use on any level of MTG competitions. 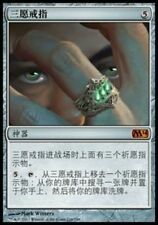 You are purchasing on the MTG Chinese cards as the title and picture shows in NM-Mint condition. No marks, scratches, or whitening on the front, back, or edges. Cards in Lightly Played condition may have minor border or corner wear, or even just slight scuffs or scratches. There are no major defects, and there are three or less flaws in the card. LIGHTLY PLAYED (LP). One (1) FOIL Door of DestiniesMagic: the Gathering trading card from M14. Card is in NM condition. Prices are similar, but changes depending on the weight you've chosen when you win a lot. Most of FAQ are answered below. If you do not find the answer you are looking for, I will gladly give you the information needed. 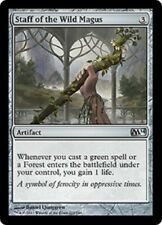 1x Elixir of Immortality M14 Magic The Gathering Near Mint. Condition is Used. Shipped with USPS Media Mail. And somthing here. --->4shared. com/folder/x0Bp-hKK/Bolt.html<-----. Warchanter of Mogis. Voice of the Provinces. Utopia Vow. Urborg, Tomb of Yawgmoth. Unburial Rites. Door of Destinies. As Door of Destinies enters the battlefield, choose a creature type. Magic 2014 (M14). 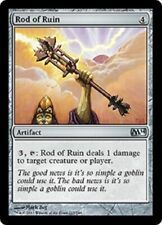 Ratchet Bomb *Rare* Magic MtG x1 M14 SP. Condition is Used. Shipped with USPS First Class Package.